Having never been to a bird festival before, I was quite excited for the opportunity to go to one. 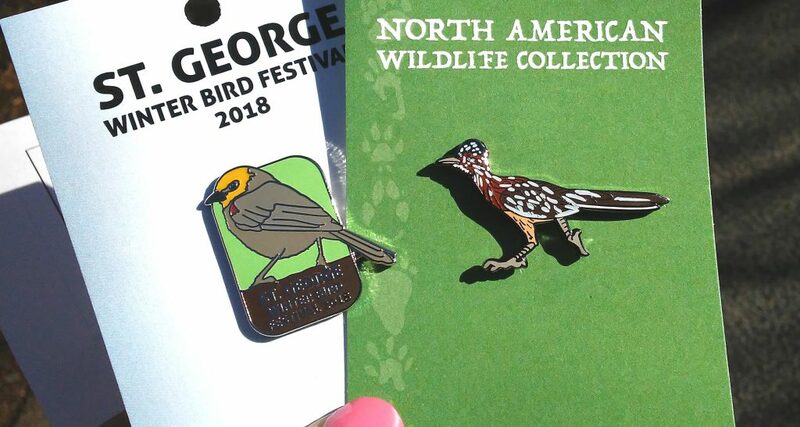 When I saw the St. George Winter Bird Festival on Facebook, I knew that it would be helpful to me in learning the birds in Utah since I just moved to southern Utah a few weeks ago. Also, it would be a great way for me to meet other birders in the state who share my passion for beautiful birds! 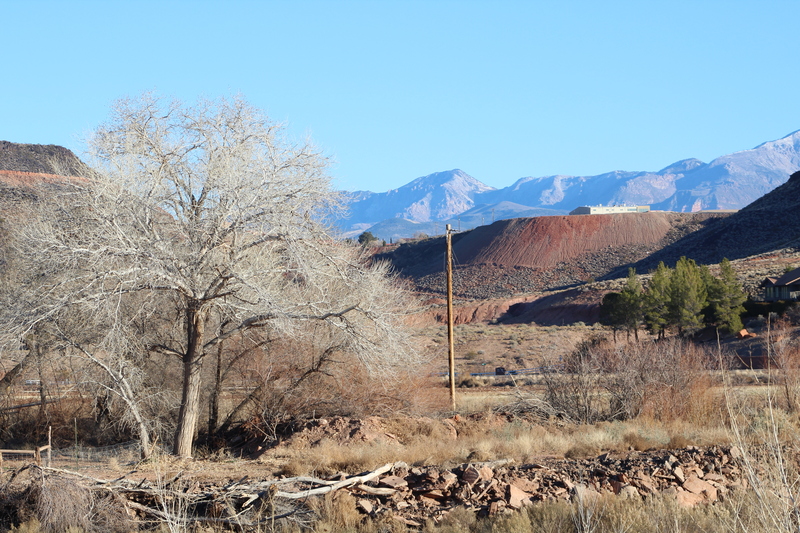 So, off to the Tonaquint Nature Center in St. George we went! On the way down, we were in a heavy snowstorm. As we drove further south, we ran out of the snow…thank goodness! The official birding pin on the left is that of a Verdin bird. The other pin was purchased in the hope that I just MIGHT see a Greater Roadrunner. I promptly pinned the both on my pink Pungo National Wildlife Refuge pink ball cap! 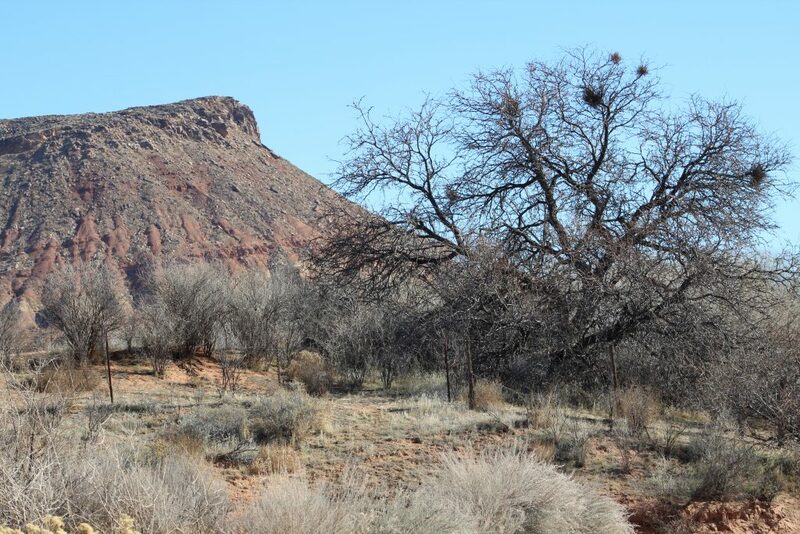 Friday morning we began by attending a fantastic presentation by Dr. Joseph Platt, a St. George avian ecologist, on the “Raptors of Southern Utah.” It helped to clarify some worries I had in trying to ID all the various raptors here. He taught us about how different stages of growth have different plumages on the raptors and can present some difficulty in trying to ID them as a beginner. 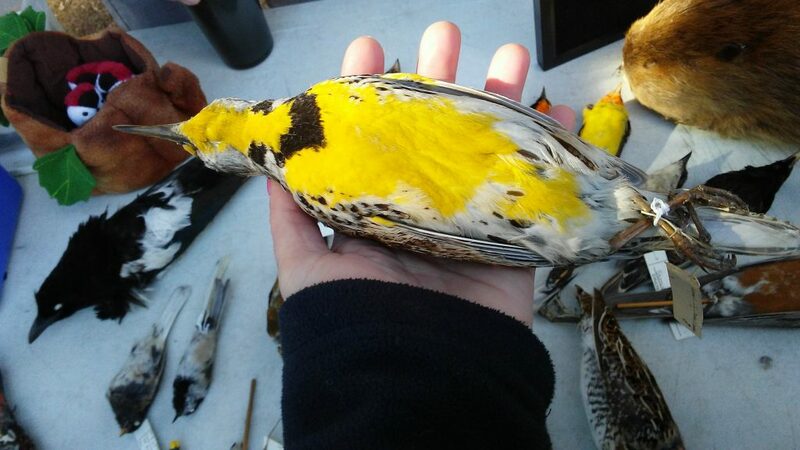 Also, he helped with long necks vs. shorter necks in silhouettes, rounded ends of tail feathers vs. square ends. We learned about the California Condors and how they are a recipe for extinction just by their behavior, how close they were to extinction, and the many efforts to bring them back to a bigger population of them. 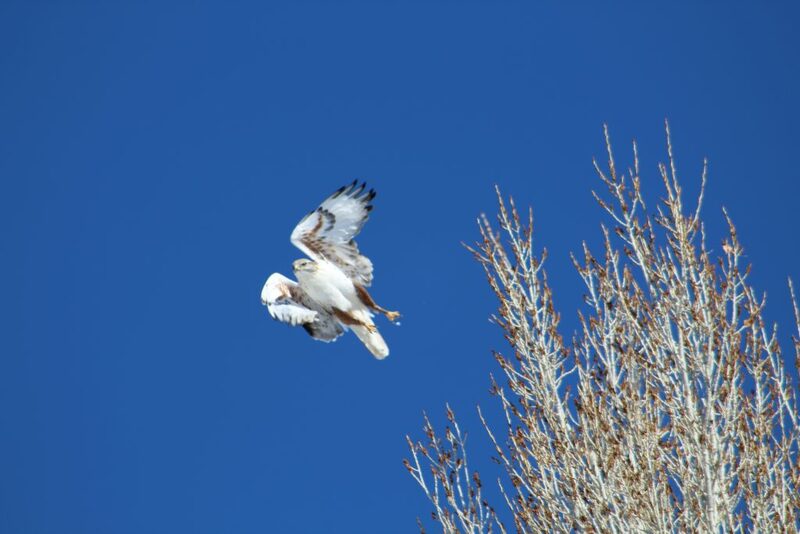 There are 19 birds of prey in southern Utah and he excited all of us with his stories and pictures about them. We loaded up the bikes for the bird festival to especially do this bike path. When we arrived there, we were an hour late due to presentation overlap. The group had already embarked on the trail, so we got on the path and knew we would run into them at some point, which we did. The Virgin River under the bridge. 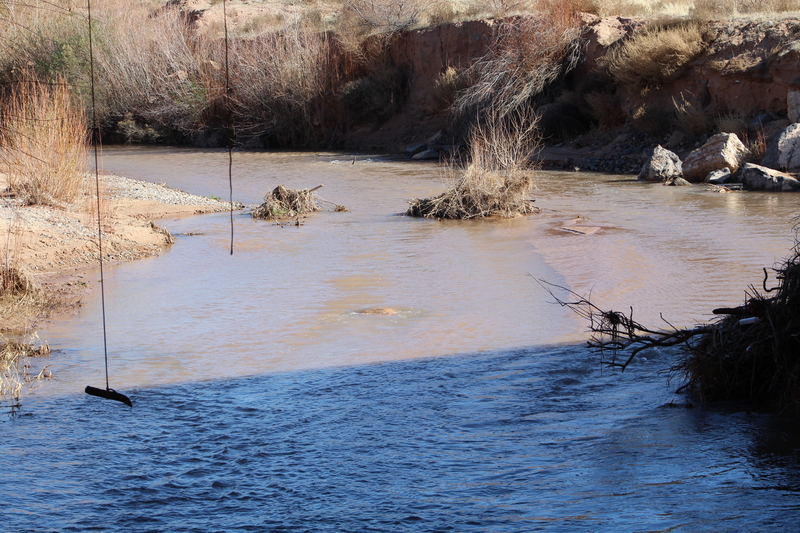 The Virgin River is a winding river, much narrower than what I’m used to back east in North Carolina. Nevertheless, it was beautiful with its riparian buffers, rocks and of course, BIRDS! 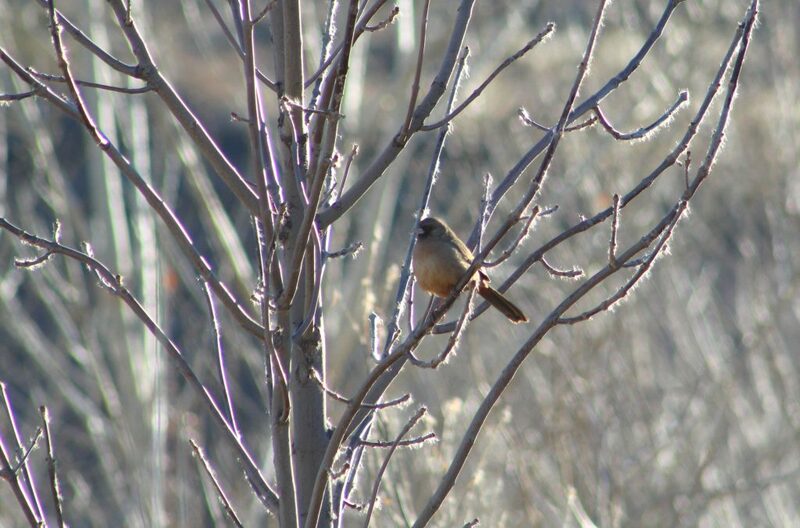 A first time bird for me, Abert’s Towhee. It’s in the sparrow family and was a beautiful almost chestnut color. 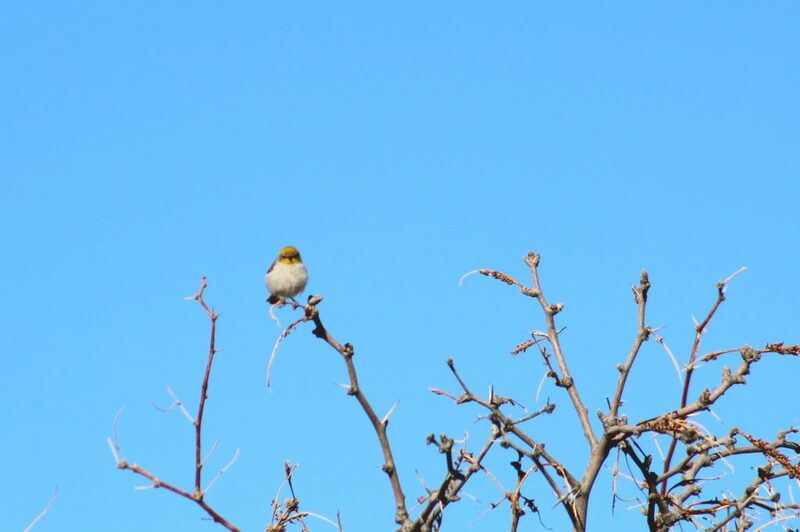 The Verdin, the official bird of the festival, sitting high atop a tree. 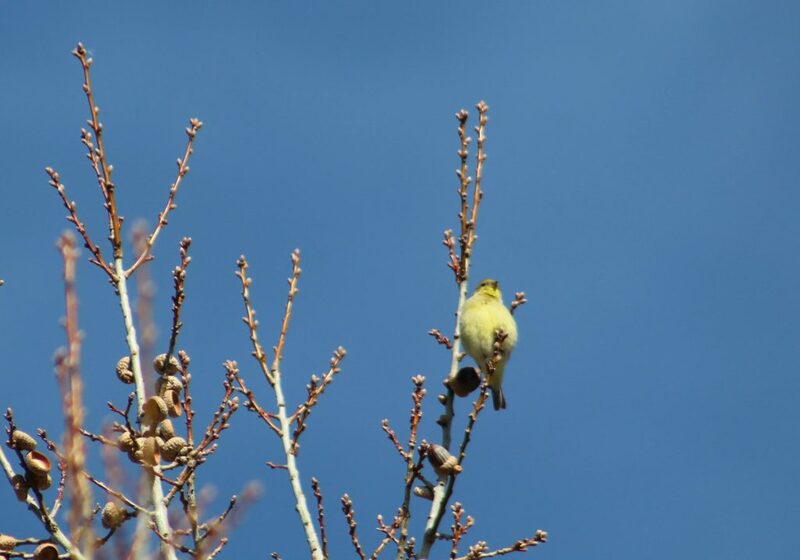 Going out on a limb here until further ID, but it looks like a House Finch. 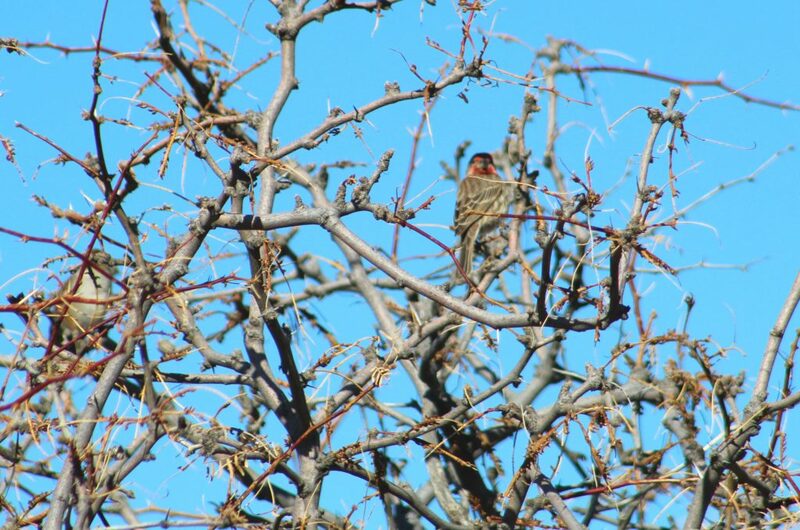 Backside of what seems to be a House Finch. Along the bike path…there’s a big bird in the tree. Do you see it? Be still my heart…we were biking along and then my dream bird stepped out onto the path! 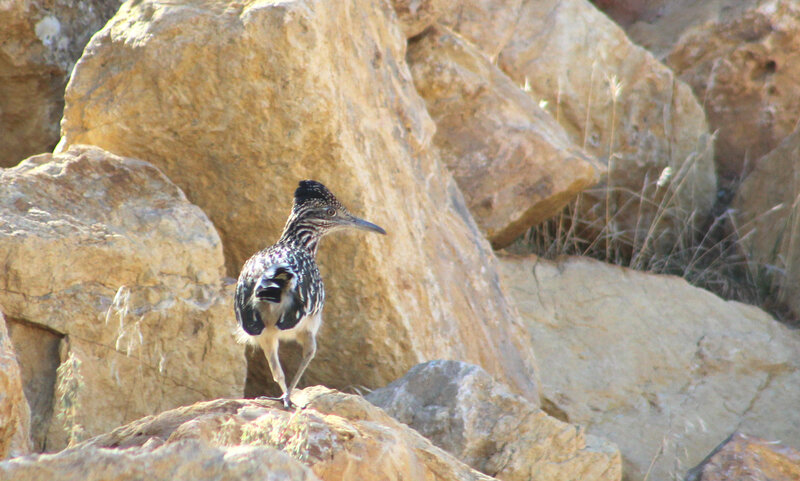 The Greater Roadrunner! 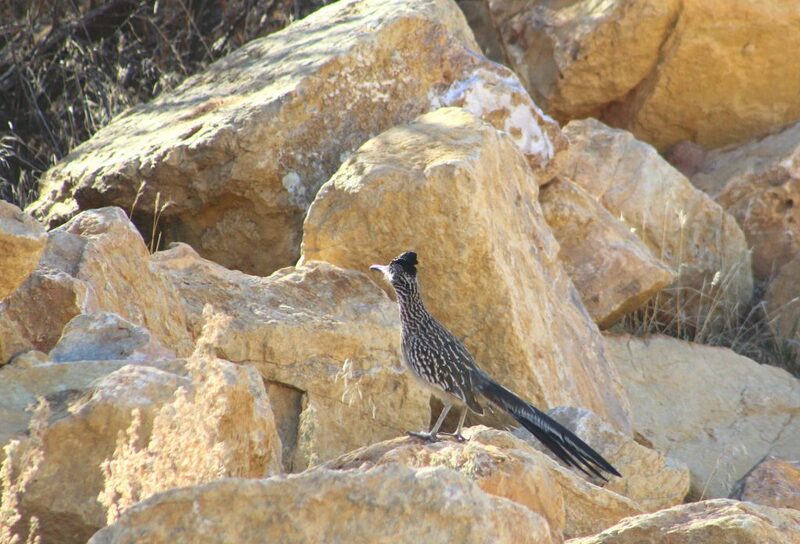 Seeing this Roadrunner made my day! He wasn’t as large as he could be, but nevertheless, seeing it was grande indeed! Still trying to ID this one. Its song was incredibly beautiful. Took a few minutes to find where the song was coming from and was pleasantly surprised when we did! These two were in a big field high up in a tree. 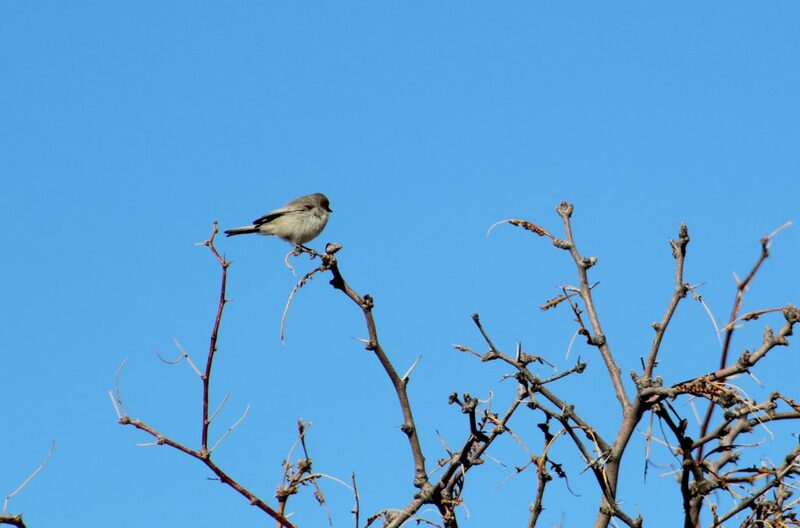 The one on the left was alone, but then the one on the right flew in. 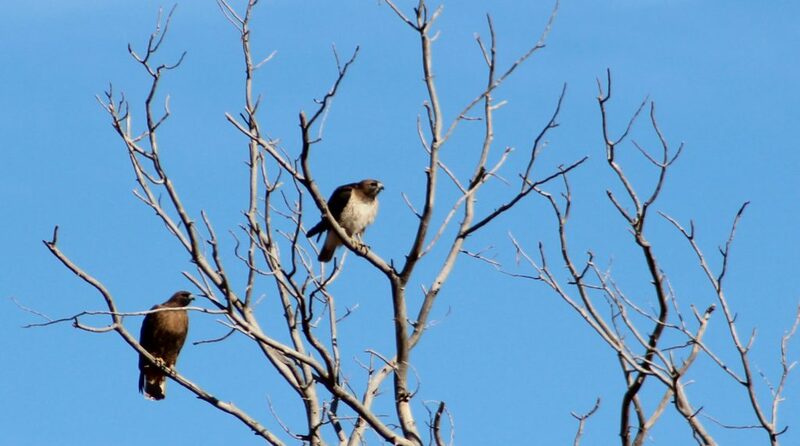 Appears to be Red-tailed Hawks, but still working on their ID. The various different colors of morphs in the raptors here is going to be a challenge for me. A farm where the hawks were. 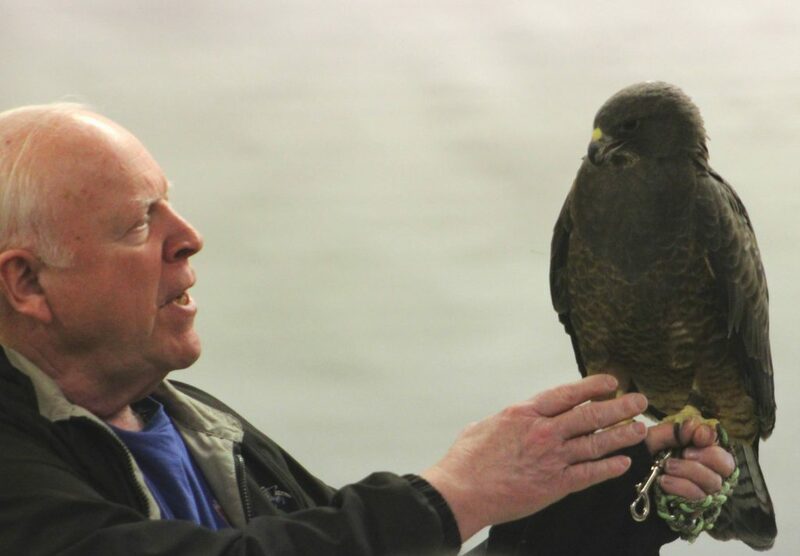 Nothing was going to do until we went early Saturday afternoon to the Live Raptor Presentation by Hawkwatch International. A live Great Horned Owl named Katori, and another raptor, Aymara, a Swainson’s Hawk, was brought in for us to learn about and see firsthand. 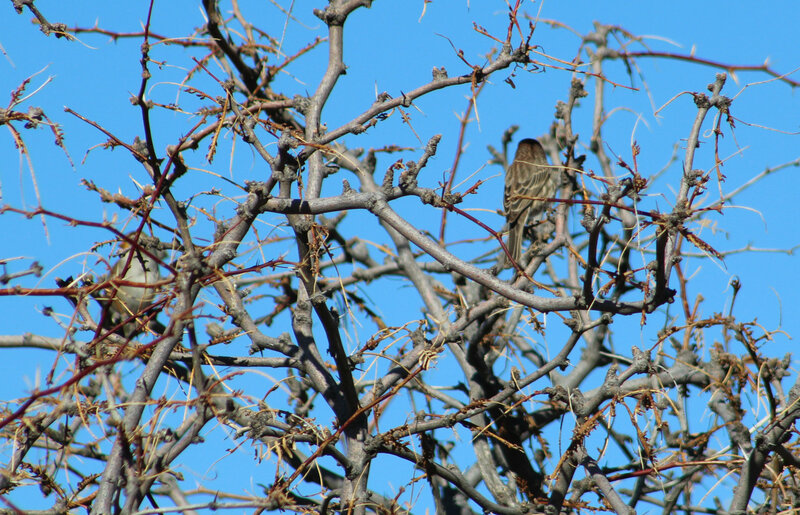 You can learn more about these two particular birds, and their story of why they are at Hawkwatch. As the handler taught us about Swainson’s Hawks, Aymara sat on his arm. What a beautiful raptor! 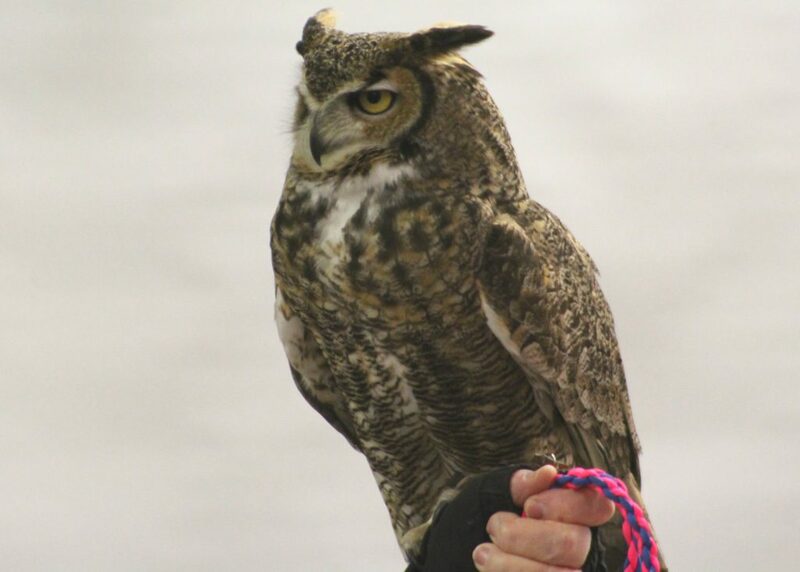 Katori, a Great Horned Owl, sits atop the handler’s wrist. What big eyes it had! The eyes are amazing. Here are some amazing owl facts you can check out. We sure learned things we didn’t know about their eyes! 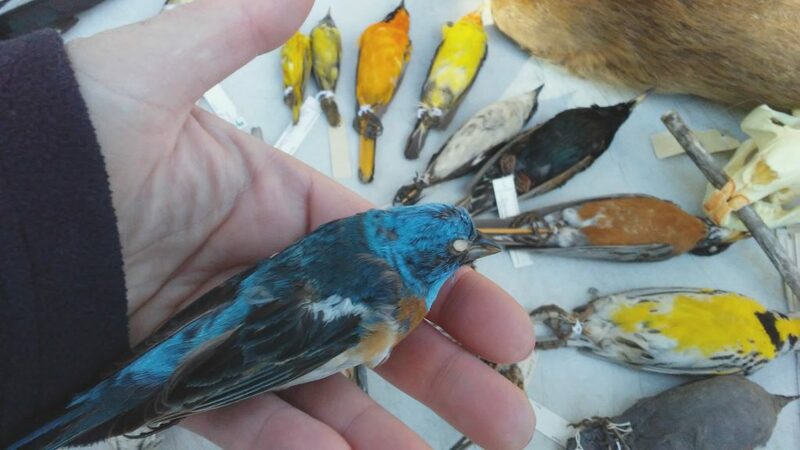 Another birder was there with deceased species often found in Utah for you to see. Since I like to hold things in my hand for proportion, I took the opportunity to hold a few of these and further inspect them to learn more about their coloration and size for identification in the field. About 8pm Friday night, we attended a short presentation by biologist Cordell Peterson on Owl Identification and Owl Ethics. We learned just how camouflaged an owl can be in a tree, their unique sounds, the various sizes and habitats they live in. 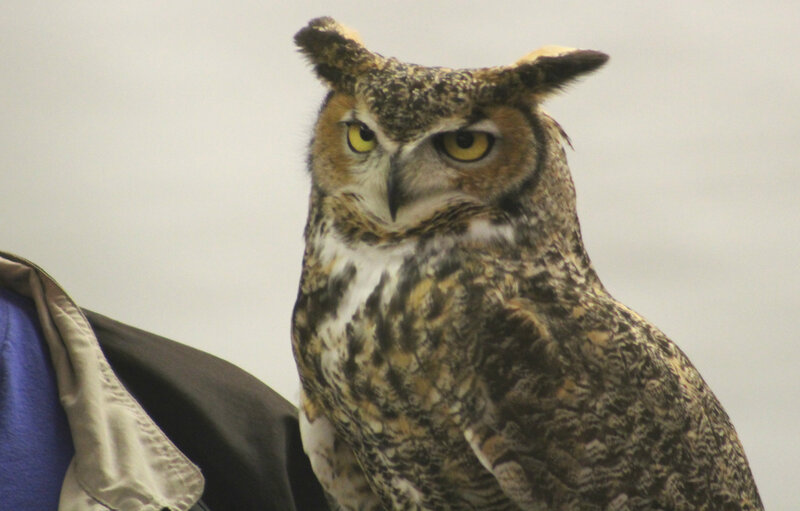 He also introduced us to the various sounds of them by listening to an app that conservation and raptor biologist Neil Paprocki had us listen to as Cordell spoke about each owl. Afterwards, we all went outside to listen for owls. We then left and traveled to a golf course to listen and look for owls. Not long after arriving, a dark silhouette was spotted on the end of the branch of a Cottonwood. It turned out to be a Great Horned Owl. It was way cool, and COLD! In the morning, we dropped in on Ken Hinton’s “Introduction to Birding” presentation at the Nature Center. He has a accounting background and birding is a hobby he enjoys. It was very informative and we learned how much more fun it is to have someone to bird with on your adventures and other items of interest. He urged everyone to not think they had to start out with expensive binoculars and cameras to get started birding. His passion for birding was contagious as he taught and shared with us about birding. Came away with an even deeper connection and appreciation for birds and their habitats. Was a great opportunity to get educated by professionals in this field in a way that we could understand. Learned through field trips how to spot, look for and listen for birds. 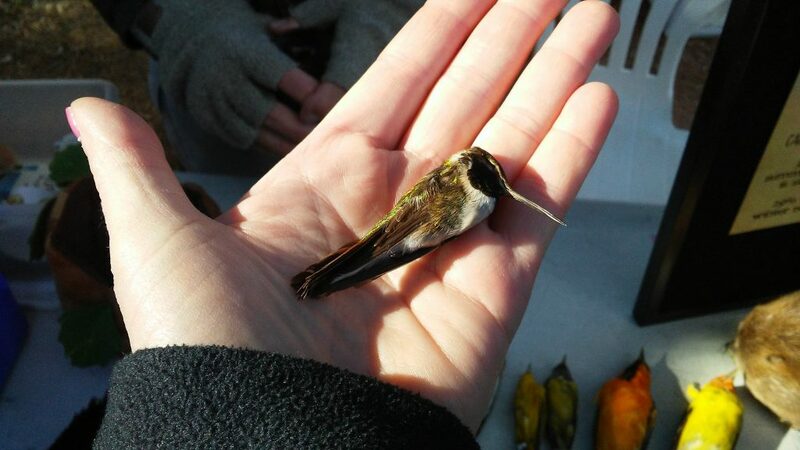 Had up close personal viewing of birds both alive and deceased to examine behavior, sounds and colors. Enjoyed casual exercise through biking and how you can bird at the same time. There were additional field trips we didn’t get the opportunity to go on. They fill up fast so if you want to attend a birding festival, so be sure to register early for them. Zion National Park, Santa Clara River, biking along the Virgin River, local ponds and washes, Beryl Junction raptors, Reservoirs, Ranches, and a walk around the beautiful Tonaquint Nature Park would have been cool to have been on, but we couldn’t do all of them. Check out your local state bird clubs and the internet for bird festivals near you in your state. I promise you’ll love the opportunity to learn about birds and make new friends at the same time! Ahhh…Till the next festival! On a brief trip into town for lunch, I went a different route than Main Street. Being new to Richfield, somehow I wound up on another road. When I was approaching a stop sign, I saw a big fluff of snow at the very top of a small grouping of some type of spruce trees. It wasn’t odd that snow was on the ground, but of all three of the trees I was looking at, the only blob of snow on them was on the very tip top. Pulling off the side of the road, I stepped out of the truck with the camera to take a closer look. Wow, was I ever surprised. 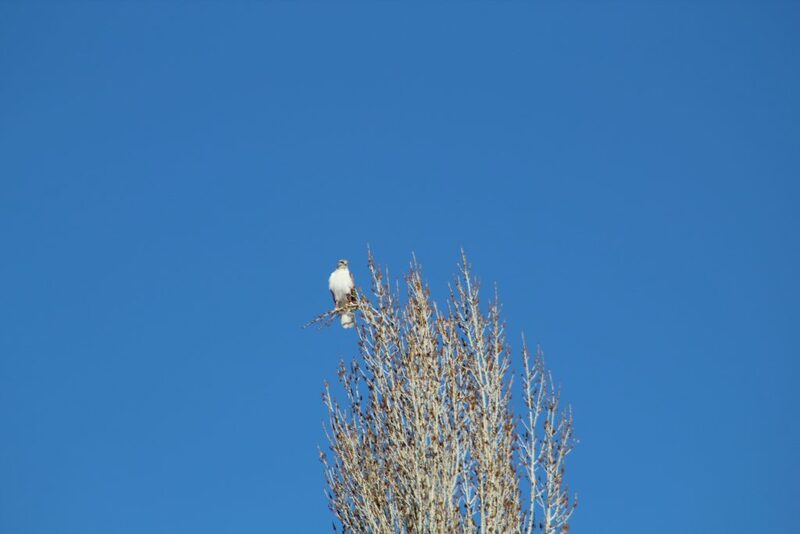 The blob of snow was the biggest, whitest bird of prey I had ever seen. It even seemed to be wearing pants (feathers) down its legs. 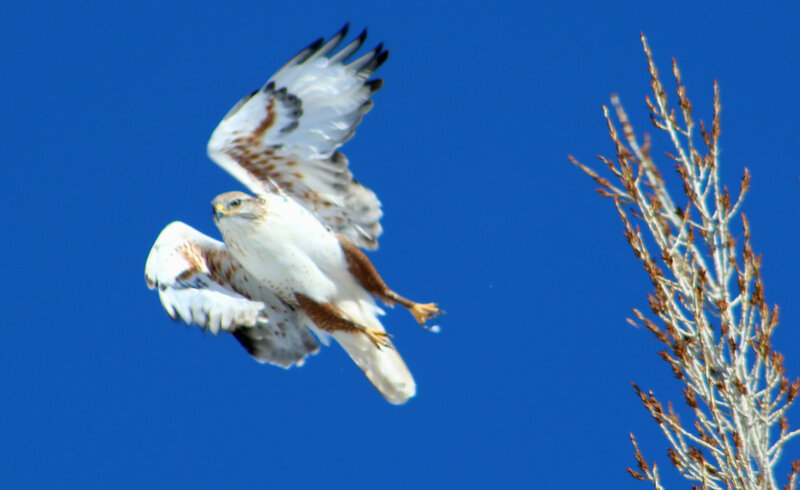 There before me was my introduction to the absolutely gorgeous Ferruginous Hawk! I enlarged and zoomed in on this photo, but from a distance, all I could see was a big snowball of white. 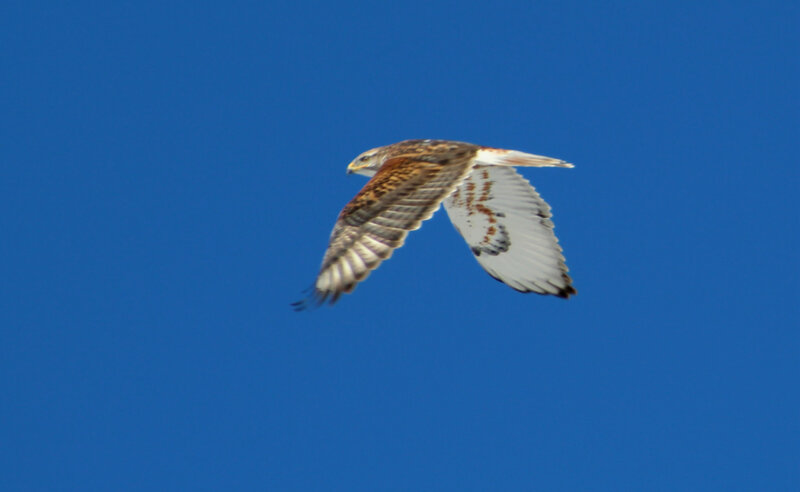 The angle of the Ferruginous Hawk to me in the truck didn’t show all of its markings. As high as the tree it was in was, the hawk took flight. I snapped photo after photo of it as best I could as it flew. Sometimes, you see something and dismiss it as being a bird. Taking a second look, pulling off the road to further look with binoculars or a camera may give you a different perspective of what you’re seeing. The only thing that made me pull off, was that there was no snow anywhere on those trees except on the top. It seemed weird on this beautiful sunny blue sky day, that there would be a huge clump of snow just on the tip top branch with all of the sun shining, and no snow anywhere else on the trees. 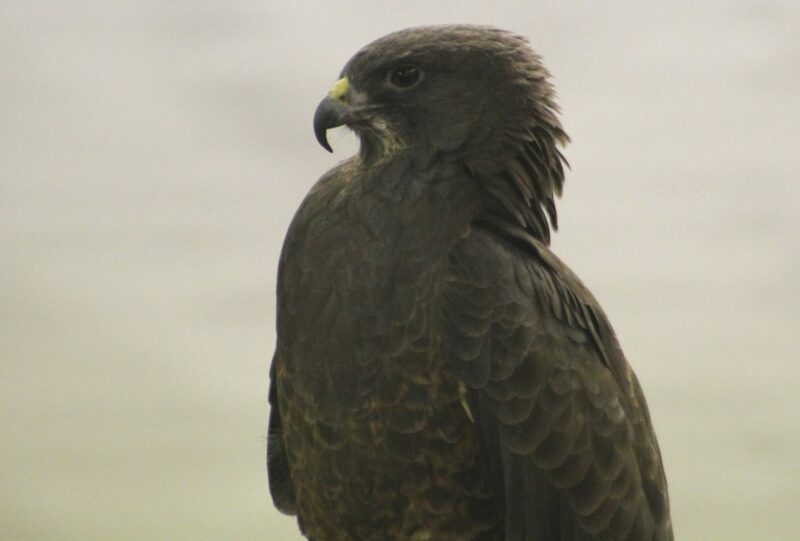 What a beautiful hawk. 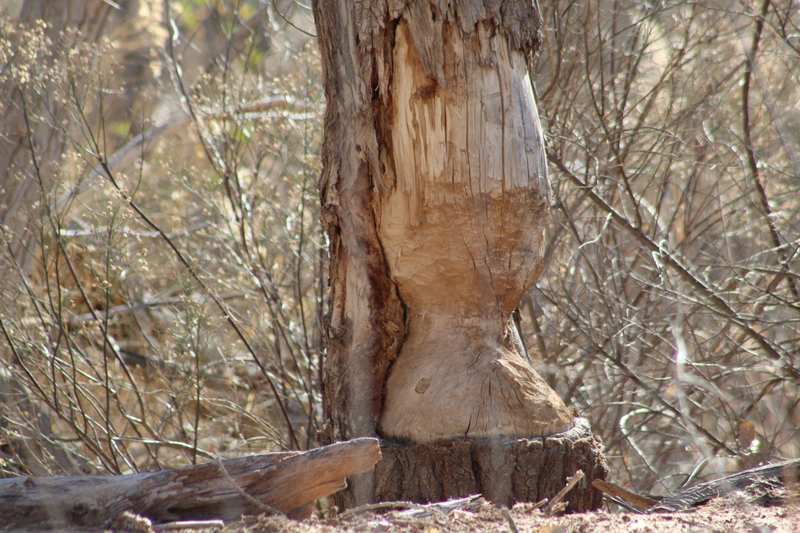 The legs were covered with a chestnut color going all the way down the leg to the golden yellow feet. Closeup of the above photo. The yellow on the beak against the light gray on the head was stunning against the blue sky. Size: 22 – 28 inches, wingspan 56 inches. This hawk is one of the largest buteos. It’s latin name “regalis” means kingly or royal. Buteos are large winged raptors that have large bodies. Beautiful large wings flapping as the Ferruginous Hawk took flight from the tree. Habitat: open grasslands, deserts. Sits atop fence posts, electrical poles. Seen in small canyons. 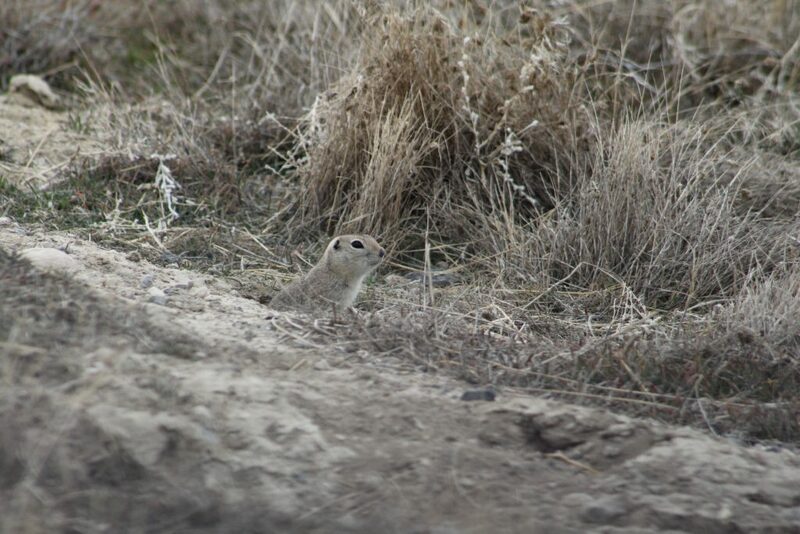 Food: ground squirrels, prairie dogs, pocket gophers (known here in Utah as “pot guts”), rabbits, rodents, snakes, lizards, some birds, large insects. 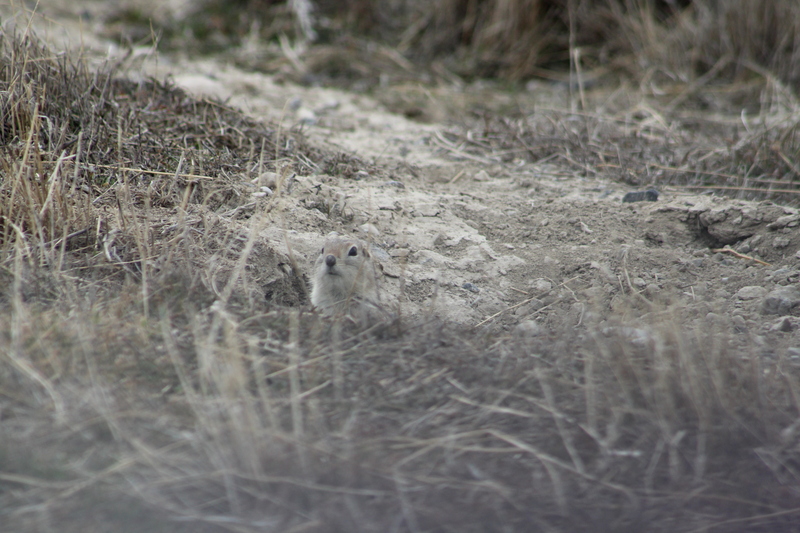 A tiny Uintah Ground Squirrel, better known here in Utah as a “pot gut.” Very cute little rodent! Nest: in areas of cottonwood trees, willows, and swamp oaks. In an isolated tree, ledges or rock, power pole or other man-made structure. May use sticks, cattails, cow dung, or grasses to line it with. A resident here in southern Utah, but consult your local birding field guide for your area. Is it migratory to my area? Am I in its most preferred habitat? Is it alone, or with a mate perhaps? Is it eating? If so, what is it eating? Is there an ample supply there of what it’s eating? If a mammal, reptile or other bird, is the “meal” a normal resident of that type of environment? The answers to these questions may help you to see your bird again near or at that same location. In my case, I went back to the road with the three tall spruce trees. 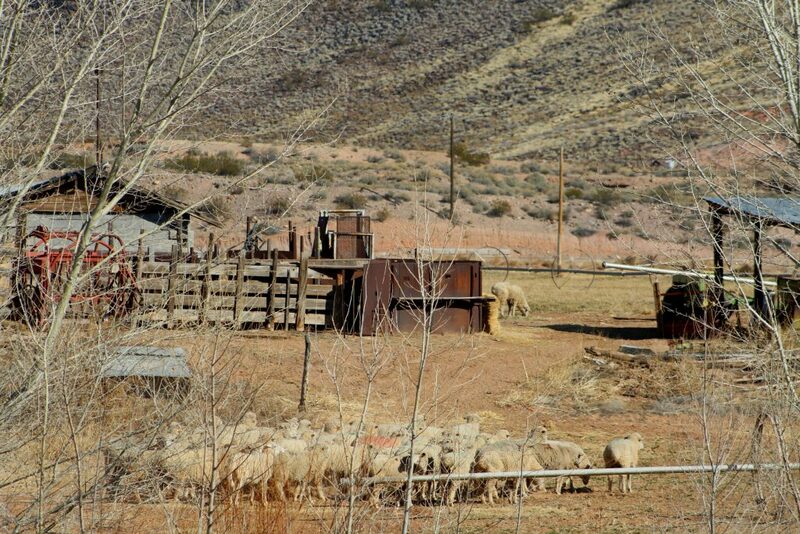 They were in the only house there as it was in the middle of vast farm and pasture lands. There were NO other trees present. It could sit high atop them and survey the pastures for some unsuspecting “meal” to show up. Two days later, I saw another Ferruginous Hawk near that area in flight. It might have even been the same one. So, try to visit the same area you saw your bird in again, particularly at the same time of day if possible. You just might see it!